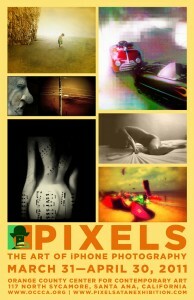 Photographer and Filmmaker Craig Anthony Perkins, founder of Genshi Media Group, will have several of his photographs along with four of his experimental videos shown at the exhibition entitled Pixels: The Art of iPhone Photography showing at the Orange County Center For Contemporary Art. This group exhibition will showcase the best iPhoneographers from around the world and will run from March 31st through April 30th 2011. The exhibition will then move to the Arty Gallery in downtown Los Angeles during the months of May and June 2011 and then to the Giorgi Gallery in Berkeley, CA., September 22nd through October 30, 2011. The curator of the exhibition is Knox Bronson who runs the leading iPhoneography gallery site Pixels At An Exhibition and is also co-curated by Jeff T. Alu, Daniel Berman and Maia Panos. The entire iPhoneography community owes them a great deal of thanks for supporting and promoting this emerging form of photography. Thank you!